What do I want from my optician? Comfortable, relaxed test intervals of 30 minutes allowing time to perform additional tests, discuss requirements and needs or provide explanations following the eye test. Highly qualified therapeutic optometrist providing NHS & private ophthalmic medicine prescriptions. 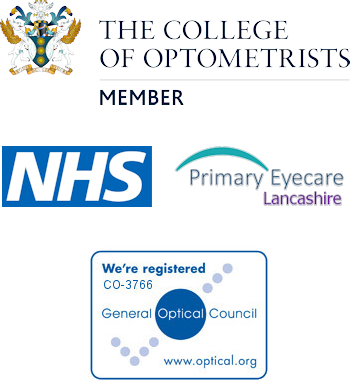 Provider of all East Lancashire’s NHS trusts enhanced optometric services. Digital Topcon retinal photography included in all our examinations at no additional cost. Specialist Digital Topcon photography of the external ocular surface can be performed, at no additional cost. Cutting edge Topcon 3D OCT retinal scan to further enhance our diagnostic ability (fees apply). Fair professional fee structure for our contact lens wearers to ensure the best value by only paying for what you use; hence not accruing large build ups of unused contact lenses / solutions. Several local & UK based frame suppliers offering a full and wide range of frame choice. We have over 1000 frames in stock covering all styles and budgets, from just £20 or free with NHS voucher. In addition to our familiar designer range, we have a wide range of frames manufactured by spectacle manufacturers and many you may not heard of. Not simply a popular brand name added to the side of a basic frame. All our Rodenstock varifocal lens range are free-form in design and come with a 60 day non-tolerance guarantee. Our in house lens tracer means you can re-use your frame and not be without it during the lens manufacture. NHS voucher patients can enjoy free single vision / bifocal lenses with subsidised upgrades for more specialist lenses and a wide range of free with voucher frames. The NHS voucher (for under 16 or under 19 in full time education) we use to cover the full cost of the prescription lenses, as well as offering subsidised upgrades for higher index, thinner lenses. Plus we reduce the cost of all our frames in store by £20. This ensures we have a large range of quality frames at no charge and higher quality frames at a lower cost. We do not offer ‘buy one get one free’ on all of our children’s spectacles. However should a second pair be needed, at the time of original purchase we offer free lenses on the second pair, so only the frame cost is charged. We also have an optometrist or qualified dispensing optician working in practice 6 days a week throughout our entire opening hours for any dispenses, adjustments or repairs. We do however, provide our home visit service on Tuesday so there may be some interruption to our in-practice optometric services provided on that day because of this. The prescribing and dispensing of spectacles are closely linked, it is best to have your spectacles dispensed where you have your eyes examined. It is often more difficult to resolve any problems you may have with your spectacles when prescribing and supply are separated. We do accept valid optical prescriptions from elsewhere, however we will often request to perform a private full eye examination and the prescription will be rechecked by us. We will refund the cost of the eye test off the glasses purchase so you are not out of pocket. This ensures we minimise any potential problems that may arise with your new spectacles. In the unlikely event that there are any issues with your new spectacles, all aspects of the prescribing process are under one roof so any problems are much easier to resolve.